The Bili Ape has characteristics that are unique to any other primate species. They exhibit behaviors that don’t fit into ape classification. It has been reported that the Bili Ape could be a new species of animal unknown to science, a new subspecies of chimpanzee, or a hybrid of the gorilla and the chimp. At the very least, the creatures are unique and unlike any studied before. Preliminary genetic testing with non-nuclear DNA has indicated a close relationship with the Eastern Chimpanzee, but the animal’s range of behaviors and facial features have greatly intrigued primatologists. The ape’s mixture of traits has led to questions of taxonomic classification. In some ways, the Bili Ape’s behavior is more like gorillas then chimpanzees. For example, they build their nests directly in the ground, using interwoven branches and saplings. However, the Bili Ape’s diet is decidedly chimpanzee-like, consisting mainly of fruits. In June 2006, British Science Weekly reported that Cleve Hicks and his colleagues from the University of Amsterdam had completed a year-long study of the ape. Hicks reported that upon meeting the animal, including adult males, the creatures would simply surround the human visitors and show curiosity. The Bili Ape did not attack or become aggressive toward the researchers, which is unusual behavior. Reports have indicated that the creature would come face-to-face with their human visitors, stare intently in half-recognition, and then slide away quietly. The major difference between the Bili Ape and the Common Chimpanzee is the size. The Bili Ape has been reported to walk bipedally at times, with the look of a giant chimpanzee. Their footprints range in size from 28 to 34 centimeters. This is longer than the biggest common chimpanzee and gorilla specimen, which has an average size from 26 cm to 29 cm. The Bili Ape has a very flat face, a wide muzzle and a brow-ridge that runs straight across and overhangs. Bili Ape skulls have a prominent brow ridge and may have a sagittal crest similar to that of a robust great ape. However, the animals other bone measurements are representative of chimpanzees. 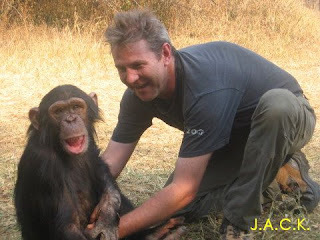 Bili Apes are currently under threat from poachers, who are taking advantage of the creature’s gentle nature.